Tags: DIY, Giveaway, How-To, Inspiration, Mixed Media, Projects, Washi Tape, washi tape project. This was my favorite because I love clock images and it would work well with vintage, steampunk and other styles! This is my favorite because I love the vintage look. Here is my pin. I love your washi tapes. http://www.pinterest.com/bailey631/washi-tape/ I love this tape because I create a lot of projects that I use clocks or watches in their theme. ♥ birds on washi or elsewhere–the second link is to a condolence card I made in May (hence the number 5 on it) using some colorful washi birds. But I also love roses…..! See my ‘No Ticky No Washi’ board on PInterest! Thanks Tisa! We’ll definitely have to take a look at your board. I liked the gold of the clock pieces and the vintageness of the timepieces caught my attention as well. I love the Time Washi Tape-it would be great for photos, calendar moments-everything!!! Did everyone else pick this one?! A lot of people like the clock washi. I am just amazed at how much detail they can put on these tapes! I love gingham anything; it can be “country” or “shabby chic” just a cool element in a great collage. Gingham washi tape is even better than ribbon, as I don’t have to put fray inhibitor on the cut ends! It’s hard to go wrong with this classic! I love this design because there are bold colors and shapes but the designs go off the edge, suggesting so much more to it! Thanks for the pin Krissy. This is a very interesting design! Absolutely love anything with roses! This is so feminine and pretty. It can go from vintage to modern with the black and white. 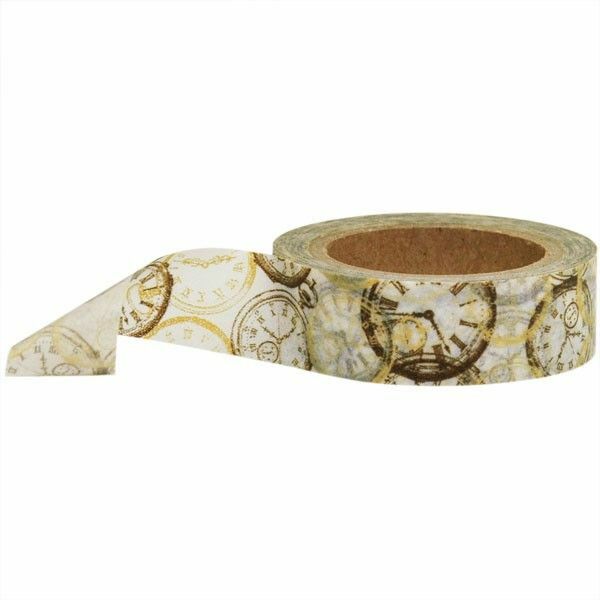 I chose the clock washi tape as my favorite because it has a classy, yet vintage, look to it. It is very versatile. I love to use washi on my correspondence and think this would be so classy on snail mail. I want all of them-lol! I love all Stampington’s washi! My favorite of the voting choices is the blackbird washi, http://www.pinterest.com/pin/75857574948657242/ because I love to do bird theme ATC’s, envies and journal pages. I think it would go really well with the grey linen polka dot tape! Thanks for the chance to enter to win! my favorite- I love all things to do with Time! I love the flow of the flowers. Perfect for a black and white flower card. I like the free style marks on this tape. http://www.pinterest.com/pin/202239839491614309/ We live in a second-floor apartment in a tree-filled Los Angeles suburb and birds are constant companions. From the wild, lime green Amazon parrots to red-hatted woodpeckers in the palm trees, we are avid watchers and listeners to what the birds add to our days. And so the birds washi is my favorite, appropriate for mail art and so much more. I think I did this wrong :( I love the blue abstract! Hi Sue, good try! All you have to do is click the little “Pin” button under your favorite washi tape image. That will take you to a brand new browser and that’s where you copy the link from. Then you just come back to the blog and paste your link here in a comment box. Let me know if you need any assistance! I love the clock washi tape. It is so vintage looking , and the gold just accentuates the brow clocks. Gorgeous! Don’t forget to add a link to your pin, Suzanne! I love the birds on a wire..it matches a stamp I have and I would love to do a journal page with them both on it. The Rose Pattern Washi Tape is so shabby and pretty, it has to be my favorite, but I love the Birdies & Gold Stripes, too. I love adding roses on all my projects and washi tape is a wonderful way to add texture, color or just that little extra something. Thanks for the Giveaway!! I pinned my favorite the pink rose washi tape. It was hard to pick a fave! I like text and thought the colors on this one were different from what you usually see on text washis. So versatile too! I am sorry, I read your post wrong at first. Here is the pin to my favorite tape, http://www.pinterest.com/pin/63331938484922525/, I love the shabby roses with the pink hue to the tape. No worries Ann. Sorry if the instructions weren’t clear. Thanks for participating and good luck! http://www.pinterest.com/pin/76631631134565287/ here’s the washi tape I like the most pinned and saved to my favorite art supply folder. I like the color and pattern in this tape the most. It was tough but I decided on the clocks. http://stampington.com/Watch-Face-Washi-Tape has the look I like to use in Vintage mixed media projects. This is perfect for the Recipe/Cookbook mini albums I like to do for family. It is also perfect for scrapbooking layouts! Hi Barbara, I can’t seem to find your Pin-It link, mind sending it again? Thanks so much. SO VERY HARD to choose a favorite, but I love vintage clocks, so I think I could find all sorts of uses for this one! Hard to choose….but I chose this one to pin! Love birds on a wire because they are so ‘graphic’ yet ‘organic’. LOVE LOVE LOVE the birds Washi tape because I love birds…I collect birds…create birds…feed and watch birds!!! I simply adore the second washi tape, the pink with black flowers. I LOVE pink anything, and the black is a beautiful contrast. I primarily use washi tape to edge my journal pages. I chose this as my fave because the color and pattern will still be visible and interesting when folded over. Plus, “time” is a recurring theme in my work. Hi McQuain, thanks so much for sharing how you use washi tape. I think you just gave some of our readers some good ideas. Good luck! LOVE the font on this alpha washi tape! My favorite because of the way it can be incorporated into art journaling! Love the hand-drawn look of this! I love doodles and this one is loaded with them. Love the ideas, and LOVE the washi tape you have shown! they are all gorgeous :D (wiping drool off) OK, here is my link: http://www.pinterest.com/pin/143059725638466535/ thanks!! I love the blue Scribble…so different than the ones that I own. Thanks for participating Elaine, good luck! I’m a sucker for clocks, maps and newsprint! I also like the two-tone pattern, which will give you a different effect depending on how dark the background you’re adhering it to is. It’s just the right length for any project. I’ve recently gotten more into nature journaling, so I love the one with the birds. Pinned – love the scribbly lines and can picture using it on many things. the foreign newspaper design would be awesome on a mixed media canvas! I love this classic design. White and gold add luster to any project. I’ll use this for journals, fat books and anything that needs a little up-scale! The birdies get my vote because I can imagine so many different ways to use them! Pinned—Love them all. Had to choose so I picked this one. I love the clocks because they go with anything and their vintage nature suits my style. It was a difficult decision. There were a few that I really liked, but I chose this was because I love words. I don’t think I’ve ever met a font I didn’t like, and I love the graphic look of lettering. LOVE wash tape!!! I would use all of these but my fav was the clocks…can’t go wrong with that imagery on anything! Love them all. But bird on the wire is very versital, in trees, as a clothes line and just way too many ways. I’m a washi tape nut,. I absolutely LOVE cooking, baking, and all things vintage, so I chose this tape design because it reflects some of the things I love. I love a mixture of typography and when cropped it becomes even more special. This washi tape emphasizes that with good, colorful, contrast. This is my favorite because it reminds me of summer picnics. Yiu have the best washi tape collection ever! It was really hard to choose, but I’d have to say the neon pink stars is my favorite! i really love neon pink right now and the stars are so cute and would make a great addition to a canvas or journal page. Although I LOVE the clock image, and the more contemporary blue abstract image, this rose tape is probably my favorite because I love the vintage feel … and it’s one I haven’t seen before! This is my favorite http://www.pinterest.com/pin/157626055682816789/ because I can see using it on handmade recipe cards and handmade cook books. I love the neutral color which will coordinate with anything. I love the vintage iconography of this tape with the forks and spoons- I would love to make some kitchen art with this tape! This one is my favorite. I think it would be much easier to lay down bird on a wire tape than stamp it. Very versatile. Tough choice!!! I love this washi tape as there are so many mixed media ideas running around my head and it was so pretty. Love the basic colors so I can match with added color to the tape in my project. They were all pretty awesome, but I picked the birds because I like the contrasting image and the bird on a line theme works so well with the medium. http://www.pinterest.com/pin/213146994839430341/ I love the translucency of washi tape, sometimes you just need that little something extra to finish whatever you’re working on. I love old yellowed ephemera, so I chose the one with colorful typeface.